Fido's Everyday Shampoo is a widely used moisturising shampoo that can be used as often as possible. The soap free shampoo is gentle on skin and is hypoallergenic. It removes dirt and soil easily and keeps coat fresh. It is also suitable to be used with flea treatment products. The special formulation with pH balance leaves your pet looking and smelling great without drying the skin. The major ingredients suspend soil in the coat and help for easy rinsing. The essential oils moisturises skin and coat leaving skin and hair radiant. The aromatic ingredient provides pleasant perfume smell and keeps skin and fur fresh. Wet coat thoroughly with clean water and pour at least 20 ml of shampoo on the backline of your pet. Work it up into a good lather all over the body. Rinse off with plenty of water and pat dry thoroughly. 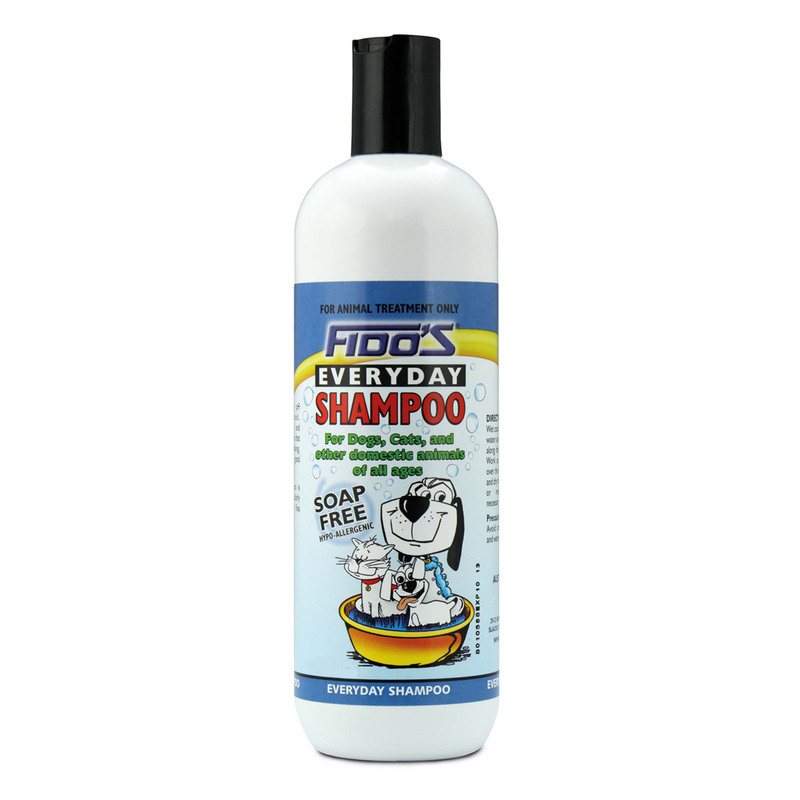 Fido’s Everyday Shampoo is soap free and hence does not cause any allergic reactions. Effectively suspends soil in the coat for easy rinsing. The soap free shampoo moisturises the hair and skin. It leaves skin and coat refreshing with pleasant smell. Use it as often as you want. Suitable to use along with flea and tick treatments. Avoid contact with the eyes and wetting inside the ears. Active Ingredients Monoethanolamine lauryl sulfate, glycerol, coco betaine, coconut diethanolamide; colour, fragrance, water, preservatives. Cleans fur effectively, No more dirt and grease. After washing i can see the difference in my dog's fur. The product is perfect for my dog. This shampoo leaves my dogs' fur soft, shiny and great smelling. Service is excellent too. Thank you! I would like to use it frequently. Wanted something for regular use, tried this and I love it! It gives a really nice sheen to my dog and its gentle too. I'm going to keep using this. For regular shampooing, I only prefer fidos everyday shampoo. It not just improves skin texture, also radiates fur sheen. Easy to buy and low prices at vetsupply. This soap free shampoo is really good for regular wash. I definitely recommend this product if you are looking for one. And the service is also too good. Keep good work guys.